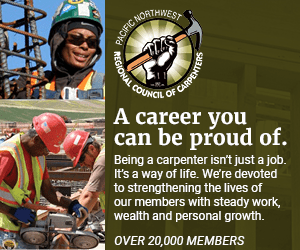 The Northwest Carpenters Union is inviting anyone with an interest in a career within the industry to a free career fair, Saturday, Sept. 21 from 10-3 at the Pacific Northwest Carpenters Institute, 4222 NE 158th Ave, Portland. There will be door prizes, food and activities for children. The retirement of the Baby Boomer generation is opening up significant opportunities in the field – but since it takes a few years to work through the ranks, the union is putting an extra focus on recruiting young people now. "The Northwest Carpenters Union is facing not only a jump in work opportunities, but an impending retirement wave that will create a huge demand for skilled crafts people," says Michael Burch, union representative for the Pacific NW Regional Council of Carpenters. "A lot of people are starting to leave the workforce and we are going to need to start filling those vacancies now and getting people into the apprenticeship program," said union spokesman Ben Bascom. This fair is an education experience, including demonstrations and videos giving out all the information needed to pursue this career path. Industry professionals will be available to answer all questions about becoming an apprentice, journeyperson and a signatory contractor. The Pacific Northwest Regional Council of Carpenters will show attendees a day in the life of an apprentice and the different pathways you can take to a rewarding career. While many are familiar with the idea of carpenters being "woodworkers," actually the field of possible job areas is wide, and includes concrete form work for high rise buildings, metal stud framing and drywall installation. "We do pile drivers on docks and bridges and highway projects; we build scaffolds – there are almost too many jobs to list," Basom said. "And they are absolutely family wage jobs." But, Basom says, carpentry is not just a job, it is a growing career field that brings with it all the perks of a professional calling. "It's a way to make a really decent hourly wage," he says. "Our carpenters receive full family health care, and when they're ready to retire they'll receive pensions for the years of hard work they did." One of the things that sets carpentry aside from other trades is the act of building something permanent, that the whole community can see and be proud of. "Many of our carpenters, myself included, we take pride in our craftsmanship," Basom said. "This is our trade and years down the road you can always look back and show your family – look, there's a building that I built. And it's a lot of pride seeing something that you've put a lot of hours, a lot of sweat into, seeing it standing there for generations to come." For more information go to www.nwcarpenters.org.